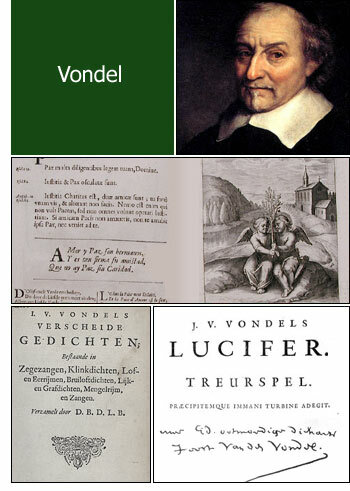 Van den Vondel was born in 1587 in Cologne in Germay, to Mennonite parents. In 1595, probably because of their religious conviction, they fled to Utrecht and from this town they went to tolerant Amsterdam in the newly formed Dutch Republic. Vondel, as a lyric, epic, and tragic poet, far surpassed all his contemporaries, and his name is honored in Holland as that of Shakspeare is in England. His tragedies, which are numerous, are his most celebrated productions, and among them "Palamedes Unjustly Sacrificed" is particularly interesting as representing the heroic firmness of Barneveldt (Johan van Oldenbarnevelt), who repeated one of the odes of Horace when undergoing the torture. Vondel excelled as a lyric and epigrammatic poet, and the faults of his style belonged rather to his age than to himself. Joost van den Vondel died on February 5, 1679.